2) Individual variation in correlated suites of behavior. Individual variation in behavioral and neural phenotype plays an important role in nature; particular phenotypes may produce differential fitness payoffs under diverse environmental conditions (Sih et al., 2004). Research over the past three decades has revealed that certain aspects of animal behavior are readily characterized by dichotomous personality categories. Several different labels consistent with this view have been attributed to personality, including: Proactive/Reactive, Active/Passive, Bold/Shy, Hawkish/Doveish, or type A/ type B. Although the term ‘personality’ is traditionally reserved for humans, these labels and the behavioral suites commonly associated with them have been increasingly attributed to non-human animals. Indeed, many animals appear to adopt particular behavioral repertoires associated with a suite of correlated physiological characteristics [e.g., Mammals (Koolhaas et al., 2007), Birds (Groothuis & Carere, 2005), Lizards (Stapley & Keogh, 2005), Fish (Bell & Stamps, 2004)]. A fundamental question at the heart of behavioral ecology is whether systematic behavioral profiles can lead to increased fitness for one or more ‘types’ of animals. Understanding the basic variation that underlies behavior, and the molecular sources of phenotypic variation can reveal much about the evolution of social dynamics, alternative behavioral tactics, and personality. In this project, we investigate the hypothesis that animal personality and basic aspects of biology, ranging from mating behavior, reproductive tactics, stress-coping strategies, exploratory behavior, and aggression can reveal systematic patterns in behavior that have identifiable molecular markers, which can be used to predict these so-called ‘behavioral syndromes.’ Moreover, identification of such molecular markers and characterization of correlated suites of behavior will reveal new insights into the evolution of social behavior and social interactions. We will use African giant pouched rats (Cricetomys gambianus) to answer some of these questions. 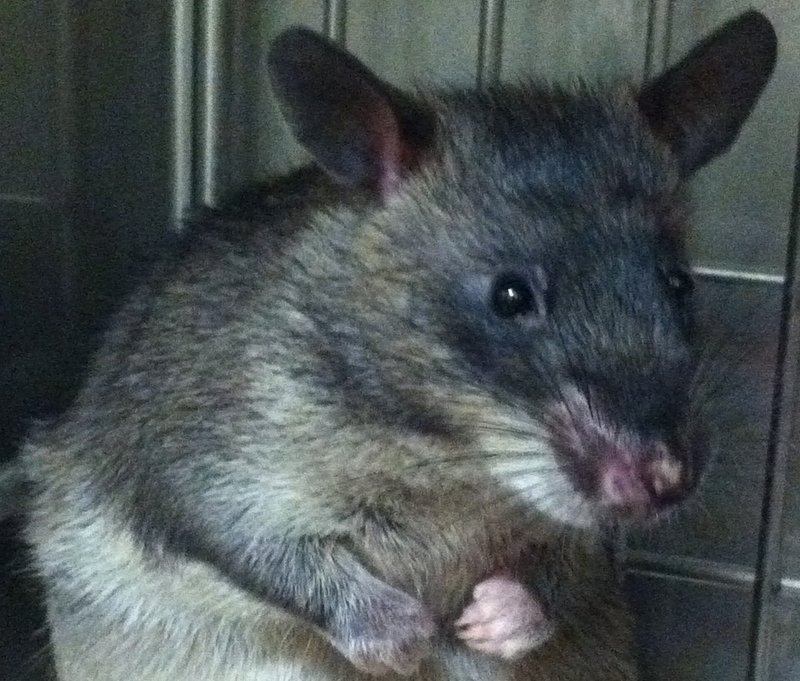 The common name, the African giant pouched rat, is a misnomer, given that it is only a distant relative of the conventional rat (Rattus rattus). In fact, the pouched rat is more closely related to gerbils than rats (Jansa & Weksler, 2004). The term ‘African giant pouched rat’ may refer to one of the two species from the genus Cricetomys, however some claim that there are many more species in this genus (Corti et al., 2005, Olayemi et al 2012). A uniting feature of the Cricetomyinae sub-family is the pouched cheek in which these animals store food while foraging. It is for this reason that they are called ‘pouched’, however their physical resemblance to Rattus is most likely a result of convergent evolution from distinct ancestors. Very little is known about the breeding behavior and mating system of giant pouched rats. Ewer (1967) suggests that males and females are solitary. Males are larger than females and some evidence suggests that males have larger home-ranges, which suggests that the mating system is polygynous (one male, multiple female). In contrast, in the lab, males appear to form selective pairbonds after mating, males may also provide superficial paternal care to offspring, and females have only a few litters throughout the year (about 3) with only 1 – 4 pups per litter (Ajayi et al., 1978, Ewer, 1967). Unlike most mammals, which demonstrate cyclical ovulation, ovulation in pouched rats is induced(Ewer, 1967, Malekani et al., 2002). These latter observations suggest that pouched rats could potentially adopt monogamy, or at least serial monogamy (having only one mating partner per breeding season). African giant pouched rats are perhaps best known for their uses in odor detection to locate TNT-based land mines and to detect tuberculosis-positive samples of sputum. Pouched rats may offer significant advantages over more conventional biodetection methods: they are readily trainable with food rewards, have a low incidence of imprinting on handlers, are easily transported in large numbers, are relatively small (low body weight and size), are inexpensive to train, and they have a high success rate of target detection. It is also worth noting that the olfactory bulbs, a brain area responsible for olfactory sensation and perception, is highly developed; it is twice the size of other comparably sized rodents (Nzalak et al., 2008). Their utility for the purposes of explosives detection makes the African pouched rat a particularly interesting animal to study. Unfortunately almost nothing is known about this species, its natural behavior or its reproductive biology. To truly develop the pouched rat as a biosensor, much about the basic biology must be known. Indeed, the most that is known about the behavior of this species comes from only a couple reports from the lab, and the most exhaustive of these was based on the allegorical account of one male and two females. A lack of basic knowledge for the ecology and behavioral habits of C. gambianus severely limits the ability to identify behaviors or environmental conditions to maximize potential for mine detection, or any other application for which this animal may be suited. Here we attempt to address several questions surrounding the natural history and behavioral ecology of the African pouched rat. In doing so, we aim to provide a better description of the animal’s natural behavior which will enable systematic study of giant pouched rats, facilitate the identification of other behaviors that could be exploited for training purposes, and help refine explosives-detection methods. We propose to address three questions that address fundamental issues in behavioral ecology or molecular biology while simultaneously advancing the development of the African giant pouched rat as a bio-detection mechanism. The latter holds great promise for the Department of Defense and the Armed Forces given the broad need for advanced methods of explosives detection by Homeland Security, protection from IEDs (improvised explosive devices), and for sweeping humanitarian efforts toward demilitarizing land throughout the world.